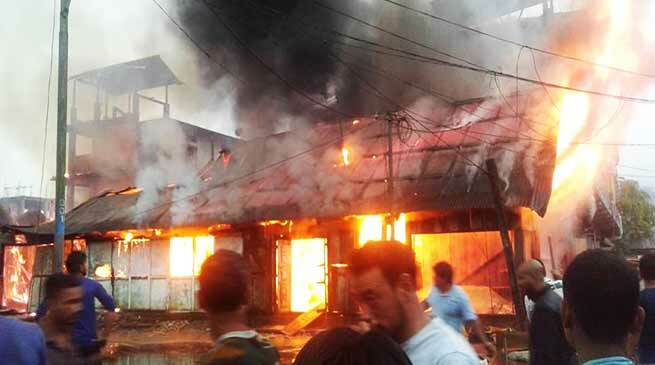 A tragedy struck at new market of Aalo Town, in Arunachal Pradesh around 12 shops were reduced to ashes in a devastating fire accident in the early morning of Wednesday. Speaking to media M.Riba SP Aalo inform that incident occurred around 4 am of this morning, were around 12 house of the Aalo New market were gutted which were generally using fore store room, there is no reports of lost of any life as the market has not properly functionalized, so the maximum room were using for storage of shops items by the shop keeper. The region of the fire accident is yet to known but the fire breakout from one of the room and spread to other.With help of Indian Army, Air force, IRBn, Civil Police, fire service and public are able to control the fire from spreading. The investigation on the incident and lost assessments is on.